Miss Ellen Reardon, in memory of her father, mother and sister, Daniel, Elisabeth and Margaret Reardon, 1880. There are a number of Reardon fountains of this design and most seem to have the identical dedication inscription. A photo of a similar fountain at Strand on the Green shows the dedication inscription engraved in the granite of the plinth. We did not see this in Avondale Park but letters carved in granite can be very difficult to see, especially on a sunny day. We need to get back, crouch down in the middle of a flower bed and use our fingers to feel for the inscription (and just brazen out the strange looks). But we've also read of these Readon fountains with an attached plaque carrying the inscription (with the same text as at Strand on the Green) so perhaps we need to look for screw holes rather than an inscription. 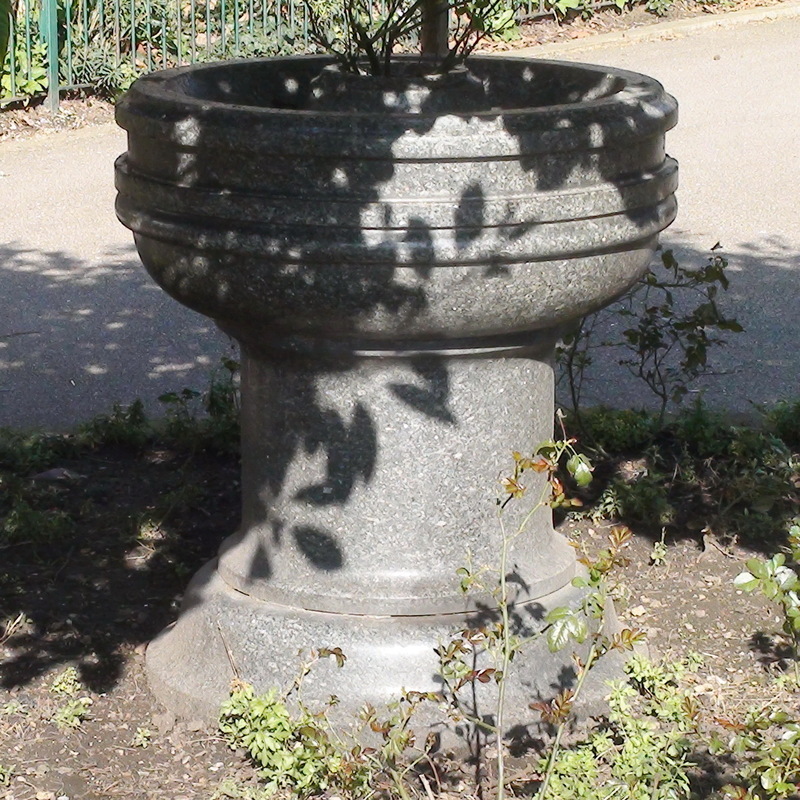 A pdf from RBKC says: "Made in grey sparkling granite, it was installed in Avondale Park in 1909 and funded by the Reardon Memorial Trust, who were responsible for 109 drinking fountains. It was taken over by the then Royal Borough of Kensington in 1936." The fountain is in the middle of the round flowerbed that you can just see in our photo. Despite the sun being in the in wrong place we wanted to capture the gate piers since they have some nice Art Deco features including roundels with 'KV', for Kensington Vestry. Compare and contrast with Emily Orbell's fountain (B).